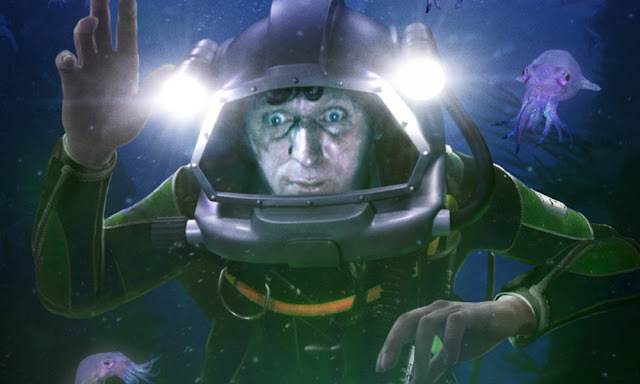 Written again by Jonathan Morris, Phantoms of the deep is his second Fourth Doctor serial for this series of audio adventures. His first, The Auntie Matter, was a hit and while this release is excellent and is a tense piece of drama, it unfortunately is the wallflower next to the loud and proud release the The Auntie Matter was. However, there is a lot to enjoy here in this tense 'base under siege' story. Wanting to repair K-9 after the events in The Sands of Life, The Doctor lands the TARDIS in one of the deepest areas of the ocean on Earth where he and Romana can repair their friend without any interuptions. However, the TARDIS is brought aboard a submarine the TARDIS team and the sub's crew find themselves descending into the Mariana Trench. But then the pressure starts dropping, ghosts start appearing and the squid begin to talk. Overall, this is a solid tale but a classic example of how the two part format of the Fourth Doctor Adventure releases can really limit a tale. It rattles along at such a pace that it is too quick giving some characters very little to do and some end up with not of a characterisation. While the tension is there, Morris has obviously been forced to move the story along quicker than perhaps he would have wanted and so what are left with is a story that ultimately feels rushed where as a story that should feel nicely paced with plenty of action. Also, most of the characters spend most of their time going in and out of a submarine which really puts a damper on the isolated feel that story is trying to portray. However, Morris is one of Big Finish's most imaginative writers and there are some great concepts in here to keep the listener's attention. There are moments which are genuinely surprising and catch the listener of guard and the story never settles down too easily. A suprising moment that is a must listen to moment is at the end of part 1 with a chilling line expertly delivered by John Leeson. The sound design is also excellent and we really get the sense that we are underwater thanks to the great work by Jamie Robertson. There is plenty of gushing water and is very spooky when it needs to be. I was very surprised to find Alice Kringe in the cast for this release. Kringe is famous for playing the Borg Queen in the Star Trek Franchise and while I enjoyed her performance immensely, her character doesn't have much to do with a not too interesting character. Overall this a good, tight, well written story with a lot to enjoy and maybe I have complained here a lot more than I should have but this story does have a lot to offer but it will always be the wallflower of this series with stories like The Auntie Matter, The Justice of Jalxar, The Dalek Contract and The Final Phase.